these version doesn’t have the media features like windows media player, which is required ( lol ) by the Device Center. So first find the Media Feature Pack for N versions of Windows 10 (anniversary) and install it, or make sure it is already installed: in fact it looks like that any major release of windows 10 will destroy the media feature pack already installed bringing back windows to its N version without the added media feature, in that case simply reinstall the feature pack of your new windows version. Then you can connect your Windows Mobile Device andif everything works, TADAA!! old windows mobile connected to new windows 10! you should see a device with a yellow exclamation mark near it. It is a couple of week i’ve started a new project, something i’ve always wanted to do, but i’ve never had time or resources or… the real will to complete it. I’m not saying i will make it this time but certainly it is progressing. Today i’ve reached a critic mass, something interesting and usefull enough to post about it, what the hispter and the millennials calls “minumum viable product”, it will be part of somthing bigger but i want to blog it to not forget it and, as i’ve found difficulties in it, maybe help someone else, who knows? My project is very “hardware” oriented, something in the real “maker” area. I’m not an hardware guy, but i’ve the minimal skill required to play whit the modern electronics, that at my eyes looks like logo bricks for grown-up (while you treat them as black box). I want to type a command in my computer (any of the my computers) and have a led turned on or off, but not by the raspberry, on the PIC microcontroller instead.this because i’ll later need some of the advanced capabilities on the PIC, but for now for educational and demonstrative purposes, the led is well enough. I know, i know, it is called Internet Of Things, and it has already been invented by someone else, but who cares? I want to make my very own IoT. Today we will cover how to connect from my pc to a raspberry who has in turn Win 10 iot on. 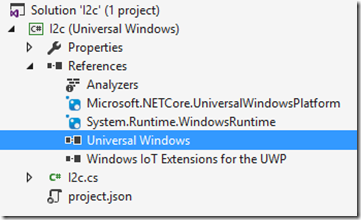 If you are intereste on how to install Windows 10 Iot, the excellent Scott Hanselman has a blog post for this. $cred = get-credential -Message "enter password" -UserName "$machine\$username"
Now i have a shell on my Pc (Grendizer) that is actually a remote session on Jeeg and i can ask Jeeg to do anything it knows. but now i want Jeeg to write a message on it’s I2C bus. Windows 10 IoT has the drivers, but powershell knows nothing about them. 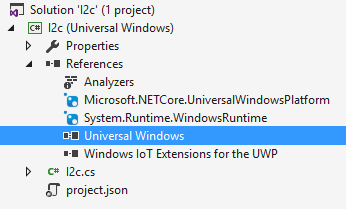 The good thing is that Powershell understand .Net very well and that Windows 10 IoT can run .Net Universal Windows App! to do this you need Visual Studio 2015 Update 2 with the Windows 10 IoT SDK that match at best possible the version of Windows 10 IoT oon the raspberry. I’ve found that the SDK are usually a couple of versions behind the Raspberry Build but fortunately it doesn’t seems to be a problem! you should have these references. that is almost enough to play with the i2c bus from the command line. I2C has also two speed,Full Speed 1MHz and High Speed 3,2MHz but Raspberry is not able (at the moment at least) to use these speed, in any case the PIC16F series doesn’t have enough processing power to handle these clocks, i think it is necessary at least 16bit PIC to work with these speed, but i’ve not investigated. C# has extension methods, and together with lambdas they provide an incredible amount of power in our hands. They way extension methods are implemented is very smart and makes them measy to write new ones, and even better, they provide a superior ide integration. That’s all fantastic, but sometime i’ve found myself in the situationwhere i have to Extend the extension methods. Let me explain my problem: consider a a program that makes use of linq over the abstraction of the unit of work. That is really really cool because if you write your generic UOW, you are basically decoupling your logic from the hard implementation of the database. This saved me one time already, with this system i was able to switch from Oracle to SqlServer in minutes, literally, without chaning any of my business logic code. That was easy because i was using NHibernate that already implements query providers for all the databases and dialects that i was interested to use at that time. Now I have a new problem. I want to have the ability to switch between RavenDb and ordinary Sql databases. I also want to not change the persistence code to accomodate a new provider, basically i want to plug insupport for new query provider without recompiling, at the extreme i just want to drop a dll in a folder and set up a new connection string in the config file. i’ve wrote a little helper project based on MEF that discovers new mapper and provides usitilities to plug them into your own set of extension methods, so all your code uniquelly depends by your persistence layer with no dependencies to particular implementations of the db. It will up to you to provide the correct mapping for all the extension methods you want to support, or simulate them (in case of async method for example) or throw exceptions and handle the situation in your business logic code. the trick is simple, let’s say i want to implement the SingleOrDefaultAsync method for all the provider i want to support. Wow! these are busy days! full of news and awesomeness! probably people prefer simple project? Stay tuned probably i'll post something in the near future about this project! Busy days... i love these! Yesterday I was preparing a laboratory pc that has windows 8 installed. In the lab I need windows 7 to work with some tools not yet ported to windows 8, so I decided to setup a .VHD and install windows 7 on it. anyway search your primary disk somewhere, it is the one that have the \Windows folder in it . at this point run bcdboot.exe /? now BootIm is again at its place, ready to display your OS choice in a graphical manner. Thanks god it had worked, and I was able to go to sleep!